I’ve watched my husband parent our children for more than 21 years now, through the mundane and the extraordinary, the humdrum and the hilarious. If there’s one thing I’ve noticed all these years, it’s that fatherhood, like motherhood, is not for the faint of heart. 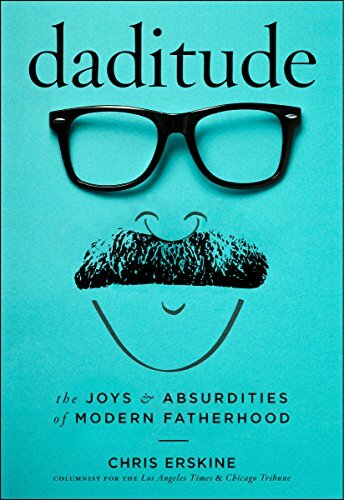 Chris Erskine, a columnist for the Los Angeles Times and the Chicago Tribune, has collected his columns on his experience of fatherhood here in Daditude: The Joys and Absurdities of Modern Fatherhood. Erskine is funny and relatable in his writing. Instead of being organized chronologically, the columns are arranged thematically. At the end of each column, there are brief addendums either from the now teenaged or even adult child about whom the column is written, his wife, or even himself many years after the original writing. As they were originally published in the newspaper, none of the columns are terribly long and each captures just one snippet of life with children. Erskine touches on the joys and fears that come part and parcel with having small, dependent people living in your house, making the personal universal through the feelings evoked within each column. Because of the non-chronological arrangement of the book, this might be better suited to dipping into than to a straight through read. The columns are warm and charming, short enough to read in the bathroom (where any modern dad might get his only peace and quiet) for those who are looking for happily nostalgic pieces.